Thank you for your interest in our digital moving guide! 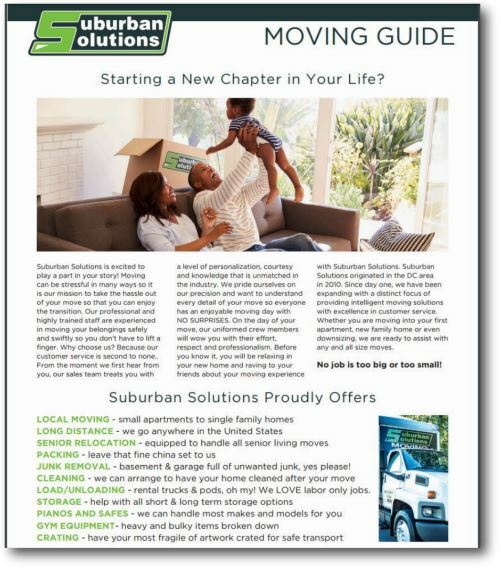 We at Suburban Solutions know just how challenging a relocation is. We also realize that the move itself is just one part of the process! Preparing for your move while trying to manage all of the other facets of moving to a new home can be a daunting task. So we put together a helpful moving guide full of moving tips and tricks to make your transition as stress-free as possible. While our moving guide is focused on the move itself, we were sure to include a helpful timeline of events that are associated with the process to keep you organized. A brief background on us so you know who may be coming into your home to help you. We want you to feel comfortable with your movers. A list of all of the services we offer. We may be able to assist you with plenty of other services and keep them off your plate. We provide things like packing and cleaning services as well! A series of frequently asked questions. We want you to fully understand the moving process, so we spent time putting together a list of questions that we see the most. If you have additional questions not listed here, please give us a call! 1-888-SUB-SOLV. Maybe we will add your question next! Moving Tips to save you money. We know what preparing for a move is like and how it’s easy to want to procrastinate and wait until the last minute. Our moving tips will keep you organized and make your move prep as quick and easy. Best of all, if you follow these move tips, you will save some time and money! Moving Checklist and timeline. We put together a series of tasks that will keep you organized, starting over a month before your move! We appreciate how much goes into a move and how easy it is to forget some things. Use this as your guideline and you will stay on top of each task. Our moving timeline will space our your prep so you are never overwhelmed and frantically preparing last minute!